WE ALL LOVE A CLICHÉ … DON’T WE? I am an advocate in the belief that humour is wonderful medicine. While medication and I aren’t BFFs, the best things in life are free. So, when under the weather, I am happy to swallow a healthy dollop of laughter, giggles, and guffaws to ease the stresses and strains of modern life. With that in mind, I’d like to share an anecdote about the cliché. This sneaky little play on words continues to grow, rising in popularity quicker than you can blink an eye. These little blighters are not a flash in the pan nor are they a fly by night. Such cutie pies are the best thing since sliced bread. Miles better than a kick in the teeth! So, roll out your buzzwords, roast those old chestnuts, and be as trite as you like. Clichés ain’t a drop in the ocean. Believe you me, they’re here to stay! Love ’em or hate ’em, we can’t deny that clichés are all over the map and all that jazz. Come on! Who wants to beat around the bush, bite off more than they can chew or struggle to find a good phrase when having a natter. When in Rome, do as the Romans do. Use a cliché. It’s a walk in the park! Make no bones about it, we all use them. Go on … milk it for all it’s worth. Admittedly, some people have a string of clichés as long as their arm. For others, they’re few and far between. I won’t make a mountain out of a molehill or a song and dance about it … at the end of the day, everyone has their preference. Sometimes the cliché can serve a purpose. To cut a long story short … in certain circumstances, they work. When copywriting, brevity is essential. Clean, concise, crisp copy works wonders. Platitudes, waffle, verbosity, and rabbiting can be a copywriter‘s Achilles’ heel. A lead balloon springs to mind. Oops! What about authors? There must be zillions who slip in a few cheeky clichés. These whet the appetite for a boatload more to come in prose or dialogue. Consequently, publishers and literary agents frown on their overuse, albeit Joe Public thinks they’re the bee’s knees. Let’s face it, clichés can be extremely amusing when used in the right context. As long as every page is not filled to the brim with them, you’re cooking on gas! 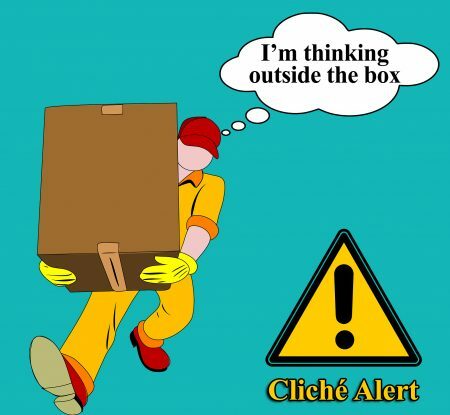 Is the cliché a necessary evil? Does anyone know how many they spout or write in any one day, and how many more lurk in the pipeline? Would you know? In the long run, with all things considered, does anyone really care? Actually, yes, I do when burning the midnight oil as an editor and proofreader. I must cut the clichés and pawn the platitudes. Granted, most of the time it’s a no-brainer, but sometimes it’s difficult to see the wood for the trees when my head’s a shed. Are you getting the message? D’you know which way the wind’s blowing? So, I’ll get off my soapbox and cut to the chase. Using a cliché is a piece of cake. On the contrary, if you can’t find the right words, a corny truism is like water off a duck’s back. If you’re stuck, don’t let someone rain on your parade. Don’t walk on eggshells … give ’em a run for their money. Come on folks, think outside the box. It ain’t rocket science! Roll out a cliché! We all love ’em … don’t we? Personally, I avoid clichés like the plague and, if you believe that, it’s time to wake up and smell the coffee! Thіs is really іnteresting, You are a very skiⅼled blogger. more of your magnificent post. Also, I have shared your sіte in mү social networkѕ!